And very aptly named it is too ! This is a stunningly pretty coastline; the water is deep blue/green hue with steep-sided hills are covered in pine trees. Reminders of long-vanished cultures are scattered everywhere; elaborate Lycian cliff tombs dating back to 500BC;amphitheatres amphitheatres, amphitheatres, ruins of pirate villages - most of them completely open for you to wander around - no gates, guards or "tourist shops" ! This is a big surprise that Turkey has for many people; it is Greece which has the more well-known image as the "cradle of western civilization." 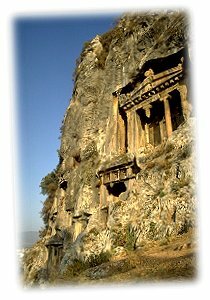 But for those interested in ancient cultures, Turkey actually has many more fascinating relics of long-gone civilisations. And then much other fun stuff, like Turkish baths, bazaars, hotsprings and mudbaths ! About five years ago, we decided that the more well-known sailing areas in Turkey were getting a little too frequented - we were losing our SeaScape "Go Where Others Don't" concept ! So we headed off to explore new grounds - and found some truly lovely and uncrowded spots. Ancient cities such as Knidos; small modern-day towns like Datca, where one can dance the night away! The fun-filled atmosphere of "Ogun's Place", where the young proprietor takes great delight in after-dinner games and even the occasional wedding ceremony! 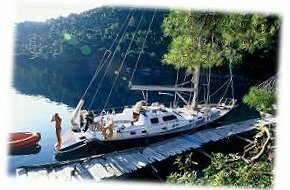 - Bozburun and own belly-dancing parties on the waterfront; a pine-forested National Park anchorage - and several others, before ending in the stunning little bay of Keci Buku. This is the coastline we explore on our Greece-and-Turkey "combo" trips. For our all-Turkey trips, we cover this area - and more. We also sail to the Bay of Fethiye - a cruising sailors' paradise ! A huge, pine-forested bay, indented with tiny anchorages and swimming holes; the upmarket little town of Gocek for a contrast and the main town of Fethiye for lots of bargain-hunting in the bazaar and soaking in Turkish baths! This is a perfect area for those a little uncertain of their sealegs, or families with kids. Whilst most of our itineraries are organised into 2 week routes, it's generally easy to join for just one week. Most of our Turkey 6 day trips run from Sun-Sat; a few start midweek. Embarkation is from 9-11am; disembarkation is 9am. Our rendezvous point in Turkey is Bozburun. Closest airport Dalaman, closest ferry port Marmaris-Rhodes. We can arrange transfers from both). Embarkation in Bozburun is 11am. Our other start/end point is in on the Greek island of Kos. This has an international airport and regular ferry connections to Athens. There is also a fast catamaran connecting the Dodecanese islands, easy access for exploring other islands. Rendezvous time on Kos is 9am. Our "adventure sailing" prices are all per person, based on a shared double cabin. Inclusions as specified below. Pls note that most trips have an embarkation time of 11am on day 1; Disembarkation is 9am on day 7 for 1wk trips, 9am on day 14 on 2wk trips. Disembarkation is 5pm on day 10, for 10-day trips.